My name is Zilby. I am a casual player who primarily plays conquest. My preferred role in conquest is the solo lane and thus, this is a guide for solo laning as Chang'e, who happens to be my first and primary goddess in Smite. This is my second smitefire guide, and I intend to update it, so feel free to comment things that should be added/edited. 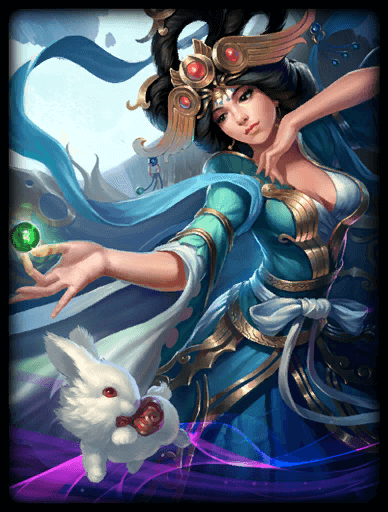 Regardless, lets move on to the goddess with the jade rabbit herself, Chang'e! Jade Rabbit is an essential passive to Chang'e. It allows you to purchase items while in lane (although you do have to wait a bit for your rabbit to run back and forth). This allows you to sit lane all game and feed off of minions, granting you potentially higher levels and gold than other solo laners. You can also buy potions and wards while in lane, which is incredibly useful. This makes Chang'e one of the very few solo laners that can stay in lane with wards at all times. Also, do note that each one of her abilities increases her mobility, so they are all excellent for both pursuit and escape. Crescent Moon Dance is Chang'e's go-to ability. It does solid damage, has a wide arc, and has an extremely low cooldown. This will essentially replace your basic attack for most scenarios, and is the highest priority to upgrade first. (I would however avoid skipping Moonlit Waltz in order to get this to level 3 by the time you're level 5, as Moonlit Waltz is essential to avoiding being ganked once assassins have their ultimates). You can also extend the range of this ability by moving to the right as you cast it due to the way the ability moves from left to right. This is best for clearing waves quickly or extending your reach to hit multiple enemies. Moonlit Waltz is an amazing ability that gives you mobility, along with immunity from all CC/damage for 1 second. It is essential to learn the timing for this ability, so you can escape even the most difficult of ganks. Despite this ability's usefulness, I would not prioritize upgrading it to higher levels, as the benefits are low compared to your other abilities. Moonflower Dance is great in three ways. It heals you and your allies a decent amount, it deals damage in a large radius to anyone caught within it, and it reduces the healing of enemies. For damage, this is a great 1,2 with her Crescent Moon Dance. Moonflower Dance also increases her mobility like her other abilities, so it can be helpful for both escaping and pursuing enemies. Finally, this ability paired with Divine Ruin can really shut down enemy healers such as Ra, Hel and Chaac. Use it wisely! **One thing some Chang'e users don't know that can add a bit of extra speed into your combo is that Moonflower Dance -> Crescent Moon Dance comes out faster than Crescent Moon Dance -> Moonflower Dance, and it sets up a stack of Spear of the Magus (assuming you've bought it) to further strengthen Crescent Moon Dance's damage, although it does leave a slightly longer cooldown on Crescent Moon Dance if you use that ability second. Waxing Moon is the metaphorical whipped cream and cherry to top Chang'e's wonderful set of abilities. It offers impressive damage at long range, and a long stun (made longer depending on the number of enemies caught within it). This is an excellent setup for allies ganking your lane, stunning entire enemy teams in teamfights, or stunning assassins to avoid being ganked in lane. Always upgrade this when possible and NEVER WASTE THIS ABILITY. Unless you're definitely going to kill an enemy, save this ability so that you won't be ganked while this ability is on cooldown. If you do, you're practically invincible. This section is built around the builds above as well as situational items. The first section is for a teamfight friendly, support oriented Chang'e. This is assuming that there is a strong mage who will bring the primary magical power to a teamfight somewhere else on your team, leaving you in more of a support mage role. The second section is for the scenario in which you will be providing the main magical power to your team as the mid laner, and need to do more damage in teamfights with less sustain. Do note however that the first scenario is ideal since Chang'e has very low scaling on her abilities, making power builds less effective on her overall. Vampiric Shroud is my go to starter item for most mages. I personally like the early game stat boosts it provides that help me put the other solo laner under tower, but if you're very confident in your early game you can start building your other items immediately. Lost Artifact grants you some early mp5 as well as some additional power. It also allows you to begin building straight into Chronos' Pendant early into the game so its gold doesn't go to waste. If you intend to build Breastplate of Valor, you may want to consider an alternative starter item. If you intend to stack with either Book of Thoth or warlock's sash, you'll likely either want to start with the beginning of either of those items or Shoes instead. Shoes provide some early movement speed and allow you to quickly send your rabbit back to shop to grab Shoes of Focus very early on in the game. This is especially useful if you intend to buy Breastplate of Valor rather than Chronos' Pendant early on in the game. Shoes of Focus are always my go-to shoes with Chang'e. Their 15% CDR is invaluable to her kit. Because Chang'e is a very flighty mage, these are best bought either as your first or second item as it makes it far easier to avoid enemies' abilities and get yourself out of difficult spots with their additional movement speed. Chronos' Pendant is essential to Chang'e since her abilities are heavily reliant on having low cooldowns. Providing both power and CDR, the Chronos' Pendant is perfect for allowing Chang'e to spam her abilities as fast as possible. This allows Chang'e to consistently use her Crescent Moon Dance to poke and heal with Moonflower Dance. As such you will want to prioritize this as either your second or third item. If playing against a particularly difficult physical god in the solo lane, or if you are being camped by a physical enemy jungler, you may want to instead consider Breastplate of Valor. Breastplate of Valor is a cheap alternative to Chronos' Pendant, providing an immense amount of physical defense for a very low price. Breastplate of Valor is an excellent item to give additional CDR as well as shut down ganks by physical assassins and attacks from bursty physical solo laners during the early game. Since Chang'e is so squishy, this will often enable her to retain enough health to stay in lane and heal rather than return to base. Do note however that you can still buy Lotus Crown as your second or third item to counter less bursty physical gods instead. Because this item provides so much defense but no health, it is preferable to pair this item with one of the health options as well. This item is best built as either your first, second or third item. Spear of the Magus is the quintessential penetration item for Chang'e. Providing solid flat penetration as well as protections reduction upon using abilities, this allows Chang'e to maximize her penetration by spamming her abilities on enemies. Spear of the Magus's protections reduction also stacks with Void Stone if you choose to use it to really allow your team's magic users to penetrate enemy defenses. This item is better if you're taking down an enemy with your Waxing Moon, Moonflower Dance, Crescent Moon Dance used in rapid succession. (For a more elaborate combo, try Moonflower Dance-> Crescent Moon Dance-> Waxing Moon-> Greater Purification(gives you 3 second CDR)-> Crescent Moon Dance-> Moonflower Dance. If done correctly there shouldn't be any lag between the abilities). You will want to grab this as either you third, fourth or fifth item. Obsidian Shard is my less preferred singular penetration on Chang'e. It has more magical power than Spear of the Magus but provides much less penetration most of the time (unless against very tanky opponents) and its power goes somewhat wasted due to Chang'e's low scaling. It also doesn't provide your team with the additional penetration as well and it is less effective when used alongside Void Stone since it is percentage based penetration. I only utilize this if I am facing a team of very tanky enemies or if I need to push towers since it provides better penetration against structures. Rod of Tahuti is a massive power buff, and as such is essential to your late game damage output. However, despite it being an amazing item, there is sometimes a misconception that it is so good that it should be bought prior to 5th or 6th item. Rod of Tahuti is massively expensive and its passive scales with your current magical power. Because of these two factors, it is only ever effective to buy it very late in the game. Greater Purification is an often needed active in almost every game. Because you cannot predict all CC, this active is often needed to escape hard CC when Moonlit Waltz cannot be used instead. It also provides CDR that can help you snag kills using Crescent Moon Dance twice in a row. However, this item can be dangerous to have if you don't leave a spot for Heavenly Agility since you can then be heavily countered by Weakening Curse so be wary. Regardless, this item can be a must have against a cc heavy team. Heavenly Agility is a must have if the enemy has or will likely buy Weakening Curse. Without it, Weakening Curse will likely cripple you too severely to be of much use to your team, or be able to escape engagements. While it is possible for another member of your team to buy Heavenly Agility for you, it is not as reliable to need them to activate it in your moment of need. Stay cautious. Thanks to Covertactician for bringing this up. Shielded Teleport is a great option for allowing you to replenish mana in base and teleport back to tower quickly. This active allows you to rotate much more often in order to help your team in the mid and right lanes. This item is less needed if you grab Book of Thoth since its mana is often enough to keep you in lane indefinitely, but otherwise either this or meditation are great options for keeping laning pressure high. With her passive she can actually stay in lane or on the battlefield indefinitely since she can always buy items and wards outside of base. It allows her to put immense laning pressure on her enemy solo laner essentially forcing them to buy Shielded Teleport to keep up and Greater Purification to get out of CC, thus locking them into a decision loop to not buy Weakening Curse and thus allowing you to not waste an active on Heavenly Agility meaning you're getting this consequence free. This active actually gives Chang'e a strong early game which can oftentimes throw off enemies, and while it isn't as strong late game as Heavenly Agility + Greater Purification, it's certainly no worse than Shielded Teleport and it still provides your team with mana and health once you upgrade to Salvation later on. Thus I vouch that this is a viable active. Compared to Shielded Teleport, this item allows you to put intense pressure on the solo lane while leaving the other lanes more or less alone, while Shielded Teleport allows you to put pressure on the other lanes at the expense of less pressure on solo comparatively. Compared to Book of Thoth, this item still allows you to stay out of base for longer (since Book of Thoth has a large pool of mana, but not all that much MP5) and allows you to build a different item rather than a different active. This is best bought as your first item while in lane with your rabbit once you have earned 300 gold because it will typically come to you once you've used up most of your first bar of mana. Upgrading this to Salvation is a low priority, as you already have a heal, and the cooldown is the same. Late game, it is a nice extra health and mana heal for teammates when you are all grouped together. HOWEVER, as was brought up by Krett, using meditation early game can get you camped in lane by the enemy jungler who will prioritize you early game since this active is less useful late game. Thus, I would avoid using this active against any enemy junglers that pose an issue to your laning phase if playing ranked, and would definitely recommend warding extensively regardless. Lotus Crown is great in a teamfight and in the solo lane because it provides you and your team with additional protections. This item also balances out your build's protections while still providing you with magical power and MP5 all for a low price, making this item a very cost effective buy. If facing a physical god, you may want to buy this as your second or third item for protection. Void Stone's usage is pretty simple. It provides both power, magical protection and reduces protections. Because of the way damage and protections are calculated, this can be an amazing tool in the laning phase against a magical solo laner, easily tipping the balance in your favor. This item is also great on Chang'e because of its added penetration. Because Chang'e's abilities lack good scaling, having great penetration is a much better way of increasing your damage output. This item is best built as your 2nd-4th item. If going against a particularly highly damaging magical god, especially healers, Pestilence is a great option for providing a huge amount of magical protection as well as a useful aura for a very low price. This item is especially useful against teams of more than a few magical damage dealers since having the bonus magical protections can be very useful. Divine Ruin is great alternative to Pestilence for taking down other solo laners with healing, and it's cheap. Its healing reduction is stronger than Pestilence but it needs to be applied, making it best for taking down enemies with really strong healing like Hel and Aphrodite (it's also important to note that your Moonflower Dance applies healing reduction as well). Because it's so inexpensive and because it's mostly just there for healing cancelling, this item can be worked into most builds to counter enemy healers in lane, and should always be used instead of Pestilence against physical healers like Hercules or Guan Yu. Book of Thoth is best used for the immense mana it provides early game. Book of Thoth should be bought early in order to build the stacks as soon as possible. This item provides a tremendous amount of power and mana, but needs stacks to be the most effective. Take this into account to make building stacks a priority, both to get your power and mana sustain high as early as possible. Do note however that Chang'e has low damage scalings on her abilities, so building raw damage like Book of Thoth is less effective on her than some other gods. If you decide not to build Book of Thoth, you should heavily consider getting either Shielded Teleport or meditation for mana sustain instead. You should begin your build with soul reliquary in order to upgrade it later if building this item. Soul Reaver works great with both Book of Thoth and Rod of Tahuti. It provides a solid amount of additional mana for Book of Thoth's passive, as well as 100 additional power for Rod of Tahuti's. On top of that, its passive is also powerful in its own right, although it lacks utility. Generally this item leaves you more of a glass cannon than your other options, but its raw power can help you burst down enemies if that's the most effective way for you to help your team. A fully stacked warlock's sash provides some of the best stats in the game out of any items in the game. With a huge 110 power, 600 health and additional mana, it's a powerhouse of an item easily making your late game monstrously dangerous. Unfortunately, it's INCREDIBLY hard to survive Chang'e's early game while trying to stack this item. In general I avoid it simply because it holds you back far too much early game, leaving you with lackluster power and health when you're most vulnerable. If you buy it 3rd or 4th item it's easier to manage, but it forces you to stay in lane to build its stacks so late rather than rotate and help your team more. In general, I would only buy this item if you think it will be worth it late game, otherwise it's not worth your time. Rod of Asclepius provides great magical power, additional healing (especially useful against healing reduction), health and movement speed. It plays on all of Chang'e's strong points, but does so for a steep price tag, and somewhat lackluster stats compared with a fully stacked warlock's sash. Still, this item can be a great replacement if you cannot stack a warlock's sash early game and still enables you to be of great help to your team late game. Gem of Isolation allows you to control enemies movements more, especially in team fights with its 25% movement debuff. It also provides good magical power and health. However, this item is costly and its large mana buff isn't very useful to you late game when this item should be bought since your mana sustain is easier to manage. Still, it can be better for Chang'e situationally if you need to provide more utility to your team. Ethereal Staff is essentially a warlock's sash with much less power, but that doesn't require stacking. If you are unable to safely stack a warlock's sash early game but still need a huge boost in health late game, Ethereal Staff is an awesome option to make you tankier without losing out on some additional firepower to your damage output. Book of Thoth is best used for the immense mana it provides early game. Book of Thoth should be bought early in order to build the stacks as soon as possible. This item provides a tremendous amount of power and mana, but needs stacks to be the most effective. Take this into account to make building stacks a priority, both to get your power and mana sustain high as early as possible. You should begin your build with soul reliquary in order to upgrade it later. Vampiric Shroud is my go to starter item for most mages. I personally like the early game stat boosts it provides that help me put the other mid laner under tower. You should also start with soul reliquary so that you can start Book of Thoth as soon as possible. Shoes of Focus provide CDR, movement speed and power, everything that Chang'e needs. Providing both power and CDR, the Chronos' Pendant is perfect for allowing Chang'e to spam her abilities as fast as possible, as well as providing MP5 and magical power. However, Chang'e does often times need physical defense to survive. This item is most useful against a mage heavy team. Breastplate of Valor is an excellent item to give additional CDR as well as shut down ganks by assassins and attacks from physical solo laners during the early game. Since Chang'e is so squishy, this will enable her to retain enough health to stay in lane and heal rather than return to base much of the time. Spear of the Magus's protections reduction allow your team's magic users to penetrate enemy defenses more easily. This item is even better if you're taking down an enemy with your Waxing Moon, Crescent Moon Dance and Moonflower Dance used in rapid succession. While Obsidian Shard has more power, Chang'e has low scaling and Spear of the Magus provides immensely greater penetration for most enemies unless they have extremely high magical defense. Rod of Tahuti is a massive power buff, but it is expensive. Unless you find yourself overwhelmed by your riches, only buy this during the late game. Soul Reaver works great with both Book of Thoth and Rod of Tahuti. It provides a solid amount of additional mana for Book of Thoth's passive, as well as 100 additional power for Rod of Tahuti's. On top of that, its passive is also powerful in its own right, although it lacks utility. Gem of Isolation allows you to control enemies movements more, especially in team fights with its 25% movement debuff. It also provides good magical power (which helps Rod of Tahuti's passive), mana (which helps Book of Thoth's passive), and health. This makes it a very versatile item that can be substituted instead of Soul Reaver as your 5th or 6th item, use wisely. Lotus Crown can be a great item to grab 4th instead of grabbing Soul Reaver later, giving you higher defenses which is especially good if you keep getting targetted by the enemy jungler. With its power, defense and MP5, Lotus Crown provides a whole host of useful stats for a relatively cheap cost making it a very viable replacement. Greater Purification is a needed active in every game as mid. Because you cannot predict all CC, this active is often needed to escape hard CC when Moonlit Waltz cannot be used instead. It also provides CDR that can help you snag kills using Crescent Moon Dance twice in a row. It's truly your only escape from rotations on your lane, which is particularly dangerous for a squishy mid laner, so only use it when it's absolutely necessary. I typically begin my build with Vampiric Shroud and Lost Artifact) and a mana and health potion (if playing mid you'll want Vampiric Shroud and soul reliquary). You will definitely need the mana camp at the beginning of the game, so make sure to get that after helping your jungler with the speed buff (if playing mid grab red buff with the duo lane before heading to lane). Once you've gotten 300 gold by killing minions, send your [[Jade Rabbit to buy meditation so that you can stay in lane unless you've decided to buy Shielded Teleport or Book of Thoth for mana sustain. Keep the pressure on the enemy laner and use Crescent Moon Dance and Moonflower Dance to both take out enemy minions (you should be able to hit the entire wave with both abilities) and heal yourself. If necessary, focus the archers since they have the lowest health and deal the highest damage. With enough poking from these abilities, you should be able to force the other laner to go to base, giving you a level and gold advantage over them. This will allow you to set up easy ganks for your assassin, or even allow you to kill the other laner yourself if they're pushing too far. Note: Taking out the blue/red buff by yourself with early game Chang'e is extremely difficult, but you do need it badly once it respawns. Try to encourage your jungler to come and get it for you, as it is essential to your staying in lane. If you find yourself getting pushed to tower instead, just stick under tower, try to kill as many minions without them being under tower as possible and encourage your assassin to come in for a gank, as you can stun the enemy laner with your Waxing Moon. Be wary of pushing too far towards their tower though. You don't have a lot of damage on your basic attacks so taking out the tower itself will be difficult alone. If you decide to push, make sure to have your Jade Rabbit bring you a ward or two, and keep your Moonlit Waltz and Waxing Moon ready for assassins trying to gank you. If you are pushed under tower because you either have a bad match-up (eg: Hel (more damage and healing) or Vamana (high damage output, waveclear and doesn't receive much magical damage) or a bad start, and your assassin is doing poorly, kill as many minions as you can, keep lane as long as you can, and wait until the late game where Chang'e can truly begin to shine. By mid game, Chang'e should be able to clear minion waves with relative ease with Crescent Moon Dance and Moonflower Dance, so if you haven't already, you should try to take down the enemy tower (make sure to use Wards when doing so). Once this is accomplished, you should try to assist other lanes if they're towers aren't down, assist them in teamfights and objectives like gold fury. Try to push lanes wherever possible to get experience and gold while doing this process, and try to make sure that you don't leave your own tower vulnerable to being taken down. Always make sure to buy items accordingly as you progress through the match. Most of these are case sensitive, so don't be afraid to think and consider before sending your rabbit off to buy something. By late game you should have four objectives to complete: Take down Fire Giant, Gold Fury, enemy phoenixes and the enemy Titan. Try to stick with your team as much as possible, as you are easy to target when alone. Your Waxing Moon is fantastic in teamfights, allowing you to stun the entire enemy team so your team can take advantage of them. While you shouldn't necessarily be on the front lines, you do have good escapes, so don't be afraid to fight the other team aggressively. Make sure to heal as many teammates as possible while you fight for objectives and try to push lanes to eventually take down the Titan. You may not rack up that many kills, but you should help most of your team's, lending you many assists. Additionally, you are also the best at saving your teammates, as your Waxing Moon and Moonflower Dance can stun an enemy and heal your teammate, easily turning a teammate's death into that of an enemy's. By the very end game, Chang'e has incredible healing, fantastic escapes and immense damage output. This is the stage that every Chang'e should try to achieve. Chang'e is often cited as one of the strongest 1v1 jousters in smite, while she's almost never found in the S+ tier, she is very commonly placed in the S and A tiers of ranked joust (at least on the very popular NShadow tier list). Personally I play her almost exclusively in 1v1 joust since she's the god I have attained the most skill with. Here I'll be going through all the tips and tricks I have for Chang'e in 1v1 joust that I've picked up. Chang'e herself is a fairly rare ban so it's uncommon that you will be unable to play her. If she is banned, it's good practice to be skilled with Hel since Chang'e is her greatest counter. Generally I would ban whichever matchups you struggle the most with, or gods that are particularly overpowered in ranked joust. Personally, I always ban Chronos since Chang'e struggles both with his early and late game and because he can inevitably tower dive and ult out to claim your tower and phoenix, hence why he is often considered the strongest god in 1v1 joust. While Hel is also a common second ban, I personally never ban her since Chang'e is a great counter to her with her insane healing reduction on her Moonflower Dance. My personal favored second ban is He Bo since he is a particularly bad matchup for Chang'e (his knockup cannot be avoided and you cannot use Moonlit Waltz while knocked up, meaning you're forced to take the full brunt of two abilities guaranteed when he engages you unless you buy magi's blessing. Overall the matchup can be won, but it's not in your favor). I personally know how to counter top tier hunters, Freya and Hades quite well, so I generally don't ban those gods, but if you struggle with one of them you may want to consider making them your second or even first ban. Finally, make sure to always leave the most common ban as the second ban (in my case Chronos since you opponent may end up banning them first, leaving you to get an additional preferential ban. 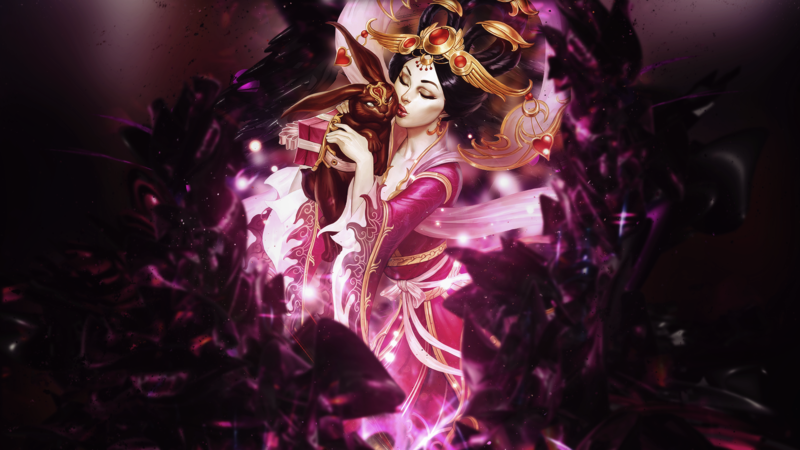 Chang'e is a fantastic solo laner and team fighter with great sustain, healing and burst damage. Once you've practiced with Chang'e for a while, it can be truly delightful weaving in and out of the fight with your dances, healing your teammates and decimating your enemies. I hope this guide helps any new or old Chang'e players out there, and happy smiting! Are you going to update this build for season 3? Zilby, unfortunately, won't be coming back for a while longer. 104051 Stuke99 [quote=The Sand Golem] Are you going to update this build for season 3? [/quote] Zilby, unfortunately, won't be coming back for a while longer. 104050 The Sand Golem Are you going to update this build for season 3? In regards to Weakening Curse or Enfeebling Curse, firstly I'd only grab Enfeebling Curse if the other team had 3 gods very focused on auto-attacks (eg: Osiris solo, nemesis jungle, hunter adc) and another member of my team (ie: the support) did not already have it. Since this is a very niche case, I didn't mention it specifically. I'd generally avoid Weakening Curse with Chang'e simply because your Moonflower Dance + Divine Ruin gives 90% healing reduction alone, so if healers are a problem I'd always take that over Weakening Curse. However, the main reason I would avoid grabbing either of those actives is from the defensive side of things. While they work great offensively, they're very easily countered by Heavenly Agility. Since you're a healer, enemies will very often grab Weakening Curse, which will utterly destroy you if you do not have Greater Purification or Heavenly Agility to at least cleanse the slow. If you grab Weakening Curse on the defensive side of things, it will either match enemies' speed to yours or not work at all if they have at least Improved Sprint, thus it's not as effective. TL;DR: they're not bad items and can be used situationally, they're just not that commonly a better choice. 99226 Zilby Thanks nanoyam! Glad you found my guides helpful ^^ In regards to [[weakening curse]] or [[enfeebling curse]], firstly I'd only grab [[enfeebling curse]] if the other team had 3 gods very focused on auto-attacks (eg: [[osiris]] solo, [[nemesis jungle]], hunter adc) and another member of my team (ie: the support) did not already have it. Since this is a very niche case, I didn't mention it specifically. I'd generally avoid [[weakening curse]] with [[chang'e]] simply because your [[moonflower dance]] + [[divine ruin]] gives 90% healing reduction alone, so if healers are a problem I'd always take that over [[weakening curse]]. However, the main reason I would avoid grabbing either of those actives is from the defensive side of things. While they work great offensively, they're very easily countered by [[heavenly agility]]. Since you're a healer, enemies will very often grab [[weakening curse]], which will utterly destroy you if you do not have [[greater purification]] or [[heavenly agility]] to at least cleanse the slow. If you grab [[weakening curse]] on the defensive side of things, it will either match enemies' speed to yours or not work at all if they have at least [[improved sprint]], thus it's not as effective. TL;DR: they're not bad items and can be used situationally, they're just not that commonly a better choice. Nice guide as always, Zilby, and upvote. Cool mini tip about the 3->1 being a bit faster than 1->3. I love me some Chang'e, though of course I don't play Conquest...the support build still applies pretty well in other modes. 1. Disagree with Meditation, looks similar to Clarity in LoL which is considered a noob trap. 3. Speaking of matchups, how good do you feel she is vs different types of opponents in general (ranged/melee, mage/warrior/hunter etc.)? 98668 Wayne3100 1. Disagree with [[Meditation]], looks similar to Clarity in LoL which is considered a noob trap. 2. Thoughts on [[Chang'e]] vs ranged matchups? I know these might not be as common at a higher level, but I just had to solo vs a [[Medusa]] and felt like her abilities were too short range to really make an impact :| 3. Speaking of matchups, how good do you feel she is vs different types of opponents in general (ranged/melee, mage/warrior/hunter etc.)? About the Guide, the healing % increase on Moonflower Dance, it's a hidden feature or it was at the beginning of Chang'e? Because it's no more written. It was an old feature, I'm not sure in what patch it was taken out in (which is why I forgot to remove it), but I'll remove it from her ability description for Moonflower Dance. I agree with you regarding wards as well, I've added a little bit in that you should be able to stay constantly warded into the rabbit description since that is a big plus of her passive (and yes it did get a speed boost, not super different but getting items AND wards is easier now). I'm starting with Soul Reliquary and Vampiric Shroud (I tried Soulstone but without success) and upgrade as soon as possible to Book of Thoth to avoid mana trouble. I get a Mana Potion during the speed camp clearing, and with blue buff, I'm only force once or twice to go to base. No need for Meditation. Also, it bring enough magic power to quickly clear with one 1-3 combo around lvl 3-4 and be able to pressure the lane. The rest of the build is exactly what I'm using. I wouldn't put Soul Reaver as primary item but I though of exactly the same alternatives. Last thing, with the change of Doom Orb I would not consider it as an alternative of Book of Thoth. Chang'e's burst isn't strong enough to stack with this item and I would prefer the additional sustain of Book of Thoth. Another great guide, thanks for your work ! soulstone isn't good on Chang'e, don't use it. Her basics aren't strong enough and she needs the health from Vampiric Shroud early game. Your start is good though, depending on matchup you may want to swap the mana potion for a health pot, but I did make the mistake of putting Shoes of Focus before Book of Thoth, you definitely want to build thoth first. As for Soul Reaver, that's there since this is supposed to be a 0-death build ie: 3->1->4->1=dead for most enemies (it also gives a little extra power because its mana helps Book of Thoth). Is that always the most practical option realistically? Probably not, I'd usually take a little more team-supporty items like Lotus Crown, Gem of Isolation, Rod of Asclepius, but that build was specifically for those that wanted a power build. Doom Orb is really only if you end up with a matchup that you'll have a stupidly easy time with and can get to full stacks without much effort. Realistically this should never happen in competitive matches, but it can be fun to build in casuals. Lastly though, while I understand that Book of Thoth gives good power and mana early game, I remain a fan of the meditation start. It gives you insane push potential (more so than Shielded Teleport since you have an extra 600g to spend on items), allows you to NEVER leave lane unless you're camped by the enemy jungler (which still forces them to camp you, leaving your jungler free to roam) and allows you to build more defenses and utility into your build making Chang'e a semi-immortal teammate that shreds enemy defenses with Spear of the Magus for your mid laner, provides health and defenses to your whole team with Lotus Crown + Rod of Asclepius, healing cancels the enemy team with Moonflower Dance, sets up constant stuns with your 40% CDR, and allows your team to sustain through any teamfight with the combination of Heavenly Agility + Rod of Asclepius + Moonflower Dance + Salvation. Even late game, meditation allows you to be a constant presence on the map since you never have to back due to the combined mana and healing you can grab with Salvation and the extra item slot which you can often use for Rod of Asclepius to heal yourself and others back to full with ease. As of late I've mostly been building the "medium counter physical" build against most team compositions to great success, if you haven't tried it I would encourage you to at least give it a shot. Thanks for your guide, it have really helped me early on with Chang'e. For quite some time I'm Diamond and would like to share my experience with her. Otherwise, I think everything is said about her. Nice guide, definitely an upvote. The rest of the build is exactly what I'm using. I wouldn't put Soul Reaper as primary item but I though of exactly the same alternatives. 94878 Lleweilyn Hi Zilby, it's me again. After [[Nemesis]], it's [[Chang'e]] and [[Artemis]] is maybe next one. Apparently we have some god in common ^_^ Thanks for your guide, it have really helped me early on with [[Chang'e]]. For quite some time I'm Diamond and would like to share my experience with her. About the Guide, the healing % increase on [[Moonflower Dance]], it's a hidden feature or it was at the beginning of [[Chang'e]]? Because it's no more written. Also, I would emphasis a bit more about the Rabbit: keeping him busy and always have a ward in hand is a key to solo lane. (Btw, did he had a speed boost? I kinda feel it but it's not written in patch notes) Otherwise, I think everything is said about her. Nice guide, definitely an upvote. Usually, I'm playing the Powerhouse build, with some changes: I'm starting with [[Soul Reliquary]] and [[Vampiric Shroud]] (I tried [[Soulstone]] but without success) and upgrade as soon as possible to [[Book of Thoth]] to avoid mana trouble. I get a [[Mana potion]] during the speed camp clearing, and with blue buff, I'm only force once or twice to go to base. No need for [[Meditation]]. Also, it bring enough magic power to quickly clear with one 1-3 combo around lvl 3-4 and be able to pressure the lane. The rest of the build is exactly what I'm using. I wouldn't put [[Soul Reaper]] as primary item but I though of exactly the same alternatives. Last thing, with the change of [[Doom orb]] I would not consider it as an alternative of [[Book of Thoth]]. [[Chang'e]]'s burst isn't strong enough to stack with this item and I would prefer the additional sustain of [[Book of Thoth]]. Another great guide, thanks for your work ! I'd imagine it's because of the wave clear. Since hades can clear a wave at around level 3/4 and chang'e only deals some damage to it you're going to be pushed into tower. If you step out of the tower to clear the wave the hades can jump at you and use his 1 an 3 combo and clear a good amount of the wave at the same time. If you use waltz to avoid the damage then he ults you and theres a good chance you can die. If you play passive until you can clear a wave you should start to win in theory, as you don't have to leave the lane to buy items while he does. As soon as he backs you gain pressure and you might be able to keep him under tower. That's all just theory of course. Also, do you not think that lotus crown should be a core item? It fits the support mage playsytle really well and it's a really strong item on chang'e too. I'd even say it could replace breastplate, and breastplate become alt. I'd also suggest adding doom orb in as a alternative, as it's really cheap and you get a lot for the cost. I'd still say to get rid of rod for something else, maybe even lotus crown. Glad to see you're keeping the guide up to date and I hope you think about what I said. As for Hades, your arguments are understandable. I guess I've probably just learned to deal with him and haven't thought about how hard it is getting pushed under towers at first for newer players. or swapping the order of Void Stone and Lotus Crown to counter most physical gods (not including the matches where I buy alternatives like Divine Ruin). That build gives you a really strong laning phase, as well as a great team presence late game, more so than what you get with the main build I have posted. However, the main build is better against high poke / burst physical gods and enemy junglers because of the huge physical defense boost you get from Breastplate of Valor, both of which can be a major problem while laning. You simply won't survive with Lotus Crown as your third item against gods like Loki because you don't get enough defense to survive his burst. Additionally, if you rush it as a second item, you're then sacrificing CDR which should be your bread and butter. However, I will admit that at least 3/4 of the time, you're probably better off with the other build. I wanted to do some testing before changing anything, but basically in conclusion you're correct, Lotus Crown should be a core item on Chang'e. I will try to get around to changing all this in my guide, but it's a lot of stuff to update so it may take some time. As for Doom Orb, the primary builds are really for a support mage role, and replacing any of the items on it for power reduces your overall utility. The mid laner should really be the one bringing the main power with any of those builds, not you. In the stacking builds, you need to get stacks and CDR early, so grabbing Doom Orb has to replace one of those. Between the two, you could replace Book of Thoth with Doom Orb and have a very good outcome. However, I really do personally prefer having insurance to be powerful late game, rather than having to refill my stacks if I die. I may add it as an alternative though, since it is a good early game item. 90035 Zilby [quote=Covertactician] I'd imagine it's because of the wave clear. Since hades can clear a wave at around level 3/4 and chang'e only deals some damage to it you're going to be pushed into tower. If you step out of the tower to clear the wave the hades can jump at you and use his 1 an 3 combo and clear a good amount of the wave at the same time. If you use waltz to avoid the damage then he ults you and theres a good chance you can die. If you play passive until you can clear a wave you should start to win in theory, as you don't have to leave the lane to buy items while he does. As soon as he backs you gain pressure and you might be able to keep him under tower. That's all just theory of course. Also, do you not think that lotus crown should be a core item? It fits the support mage playsytle really well and it's a really strong item on chang'e too. I'd even say it could replace breastplate, and breastplate become alt. I'd also suggest adding doom orb in as a alternative, as it's really cheap and you get a lot for the cost. I'd still say to get rid of rod for something else, maybe even lotus crown. Glad to see you're keeping the guide up to date and I hope you think about what I said. [/quote] I realized after posting this that this is a wall of text, so I'm gonna add spoilers to make this more readable :] [spoiler=Hades Comments]As for [[Hades]], your arguments are understandable. I guess I've probably just learned to deal with him and haven't thought about how hard it is getting pushed under towers at first for newer players. [/spoiler] [spoiler=Lotus Crown Comments]As for [[Lotus Crown]]... I'm very conflicted. The first build is my tried and true build, [[Chang'e]] was the first goddess I ever played and that build has worked time and time again. Recently though, I've rarely played a match without [[Lotus Crown]], it's just so good! On a regular basis, I've either been using the counter magical build ie: [icon=Shoes of Focus] -> [icon=Chronos' Pendant] -> [icon=Void Stone] -> [icon=Lotus Crown] -> [icon=Spear of the Magus] -> [icon=Rod of Tahuti] or swapping the order of [[void stone]] and [[Lotus crown]] to counter most physical gods (not including the matches where I buy alternatives like [[Divine Ruin]]). That build gives you a really strong laning phase, as well as a great team presence late game, more so than what you get with the main build I have posted. However, the main build is better against high poke / burst physical gods and enemy junglers because of the huge physical defense boost you get from [[Breastplate of Valor]], both of which can be a major problem while laning. You simply won't survive with [[Lotus Crown]] as your third item against gods like [[Loki]] because you don't get enough defense to survive his burst. Additionally, if you rush it as a second item, you're then sacrificing CDR which should be your bread and butter. However, I will admit that at least 3/4 of the time, you're probably better off with the other build. I wanted to do some testing before changing anything, but basically in conclusion you're correct, [[Lotus Crown]] should be a core item on [[Chang'e]]. I will try to get around to changing all this in my guide, but it's a lot of stuff to update so it may take some time. [/spoiler] [spoiler=Doom Orb Comments]As for [[Doom Orb]], the primary builds are really for a support mage role, and replacing any of the items on it for power reduces your overall utility. The mid laner should really be the one bringing the main power with any of those builds, not you. In the stacking builds, you need to get stacks and CDR early, so grabbing [[Doom Orb]] has to replace one of those. Between the two, you could replace [[Book of Thoth]] with [[Doom Orb]] and have a very good outcome. However, I really do personally prefer having insurance to be powerful late game, rather than having to refill my stacks if I die. I may add it as an alternative though, since it is a good early game item. [/spoiler] *Have updated guide to be in response to these comments, thanks for the help! * Thanks for the feedback as always! Lotus Crown is in this guide :P I've been using it quite a lot recently, a personal favorite on her in season 2. However, explain how Hades is a bad matchup? You can usually just poke him down with your healing reduction and Crescent Moon Dance and if he ults you you can just use Purification Beads and Moonlit Waltz. Admittedly he is tanky and packs some damage, but he's really easy to just poke down since he's so immobile most of the time and needs to be in the middle of the wave to clear. 90027 Covertactician [quote=Zilby] [quote=hellfish1998] Chang'e has 1 bad matchup (Hades) and out right wins every other because of high poke and high healing reduction. Divine ruin is a core item if they have a heal of some sort (rushed if your against hel or Aphrodite). Lotus crown should be on this guide because it makes her almost invincible with its passive. [/quote] [[Lotus Crown]] is in this guide :P I've been using it quite a lot recently, a personal favorite on her in season 2. However, explain how [[Hades]] is a bad matchup? You can usually just poke him down with your healing reduction and [[Crescent Moon Dance]] and if he ults you you can just use [[Purification Beads]] and [[Moonlit Waltz]]. Admittedly he is tanky and packs some damage, but he's really easy to just poke down since he's so immobile most of the time and needs to be in the middle of the wave to clear. [/quote] I'd imagine it's because of the wave clear. Since hades can clear a wave at around level 3/4 and chang'e only deals some damage to it you're going to be pushed into tower. If you step out of the tower to clear the wave the hades can jump at you and use his 1 an 3 combo and clear a good amount of the wave at the same time. If you use waltz to avoid the damage then he ults you and theres a good chance you can die. If you play passive until you can clear a wave you should start to win in theory, as you don't have to leave the lane to buy items while he does. As soon as he backs you gain pressure and you might be able to keep him under tower. That's all just theory of course. Also, do you not think that lotus crown should be a core item? It fits the support mage playsytle really well and it's a really strong item on chang'e too. I'd even say it could replace breastplate, and breastplate become alt. I'd also suggest adding doom orb in as a alternative, as it's really cheap and you get a lot for the cost. I'd still say to get rid of rod for something else, maybe even lotus crown. Glad to see you're keeping the guide up to date and I hope you think about what I said. Chang'e has 1 bad matchup (Hades) and out right wins every other because of high poke and high healing reduction. Divine ruin is a core item if they have a heal of some sort (rushed if your against hel or Aphrodite). Lotus crown should be on this guide because it makes her almost invincible with its passive. 89873 Zilby [quote=hellfish1998] Chang'e has 1 bad matchup (Hades) and out right wins every other because of high poke and high healing reduction. Divine ruin is a core item if they have a heal of some sort (rushed if your against hel or Aphrodite). Lotus crown should be on this guide because it makes her almost invincible with its passive. [/quote] [[Lotus Crown]] is in this guide :P I've been using it quite a lot recently, a personal favorite on her in season 2. However, explain how [[Hades]] is a bad matchup? You can usually just poke him down with your healing reduction and [[Crescent Moon Dance]] and if he ults you you can just use [[Purification Beads]] and [[Moonlit Waltz]]. Admittedly he is tanky and packs some damage, but he's really easy to just poke down since he's so immobile most of the time and needs to be in the middle of the wave to clear. 89870 hellfish1998 Chang'e has 1 bad matchup (Hades) and out right wins every other because of high poke and high healing reduction. Divine ruin is a core item if they have a heal of some sort (rushed if your against hel or Aphrodite). Lotus crown should be on this guide because it makes her almost invincible with its passive.